Eva-Maria Westbroek stars in the title role of Zandonai’s sensuous drama, opposite Marcello Giordani as Paolo, in this Live in HD presentation. 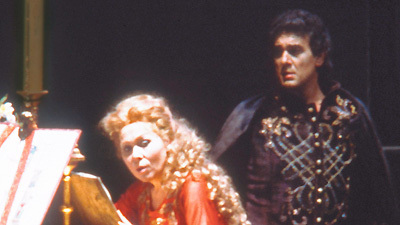 Piero Faggioni’s lush production provides the perfect setting for one of the all-time great tales of tragic passion, adapted from an episode in Dante’s Inferno. Mark Delavan co-stars as Giovanni, the husband and brother of the star-crossed lovers, whose jealousy leads him to kill them both. Robert Brubaker is Malatestino and Marco Armiliato conducts.